This tutorial demonstrates how to create Rules based on Intercepted Dat	a after an Intercept Rule has been created. Intercept Rules make it possible to evaluate data that has already been run in a rule as well as adding any additional rule needed to evaluate past data and new data. This data can be viewed in theRule Set Results Folder. 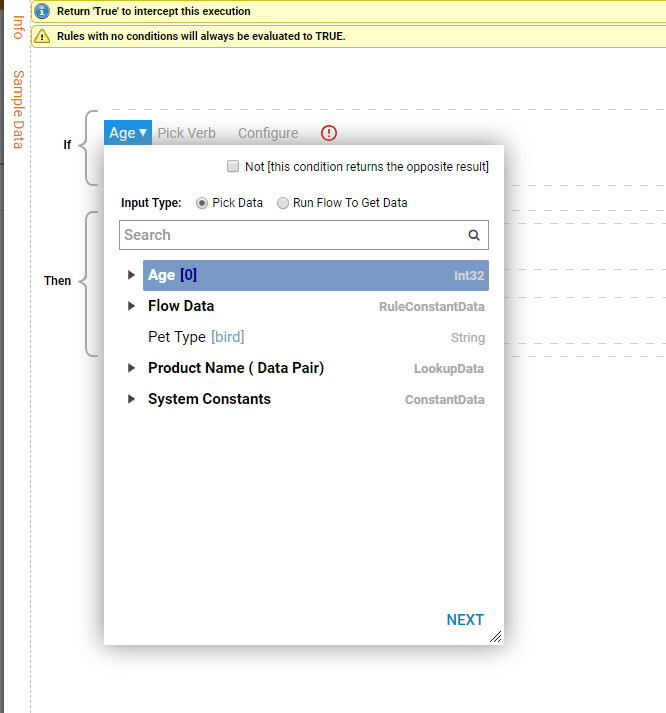 In this example use***Intercepted Data***	to add an Interceptor Rule, begin in the Rule Set Results Folder. With Intercepted Data	record selected on the Intercepted Results Report	select Add Rule > Intercept	on the Folder Actions Panel. 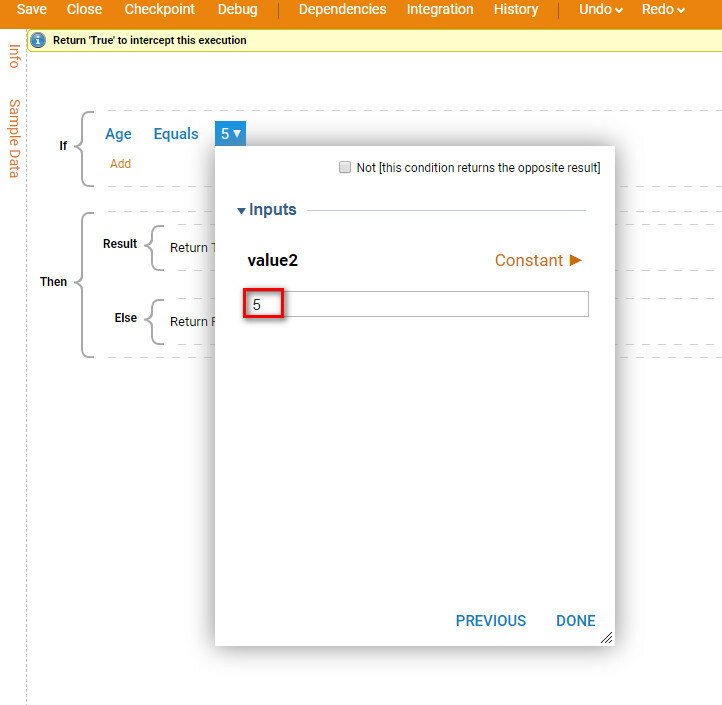 Note:	The option to add an Evaluation Rule	can be done in the same way that you add anInterceptor Rule. 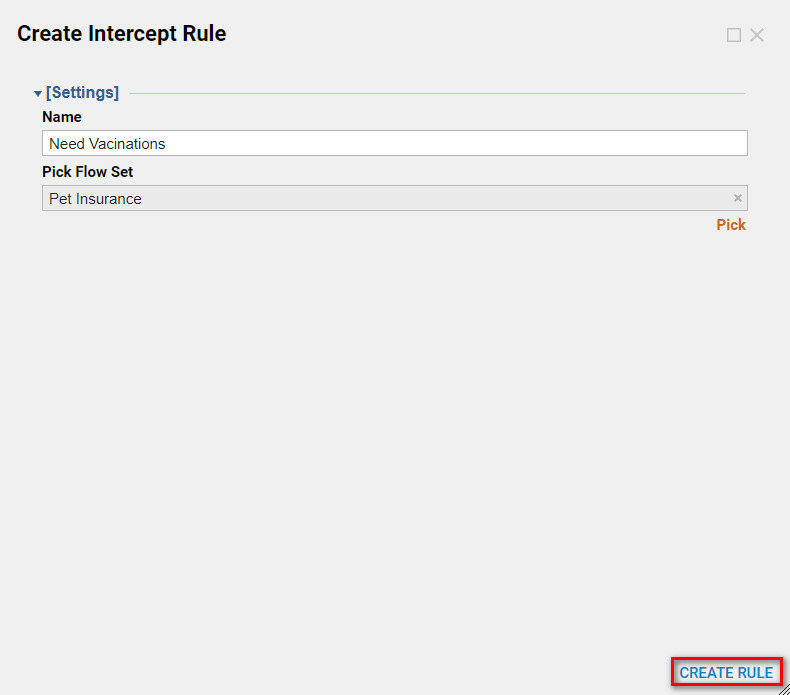 Next, give the new Intercept Rul	e a name, Name	the Rule and select Create Rule	to proceed to the Rule Designer . This Intercept Rule	will apply to the whole Rule Set. In the Rule designer begin creating anInterceptor Rule. This Rule will evaluate whether theAge	is5	and if the age of the pet is 5	it will evaluate true. In the Rule Set Results,	select one of the results from the Intercepted Data. Right-click and selectAdd Rule	or choose Add Rule	from the action panel at the bottom of the page. 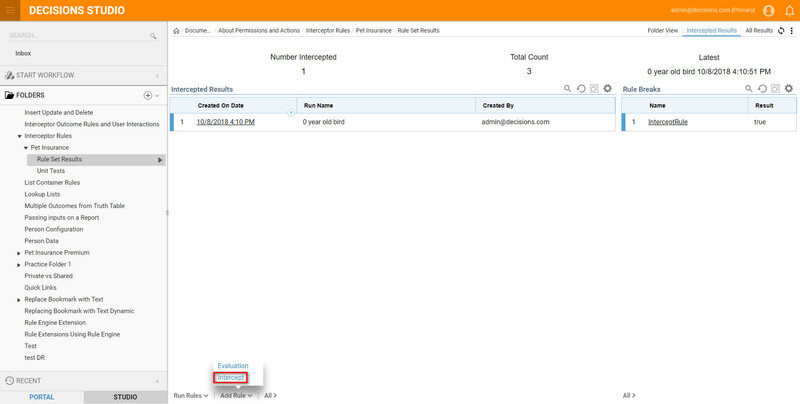 The Add Rule	action gives you the option to either run anEvaluation rule	or run anIntercept Rule. In the Rule Set Results Folder	the data related to the selectedIntercept Rule data	will show in theFlow Data	as theRule Phrase	is being built. 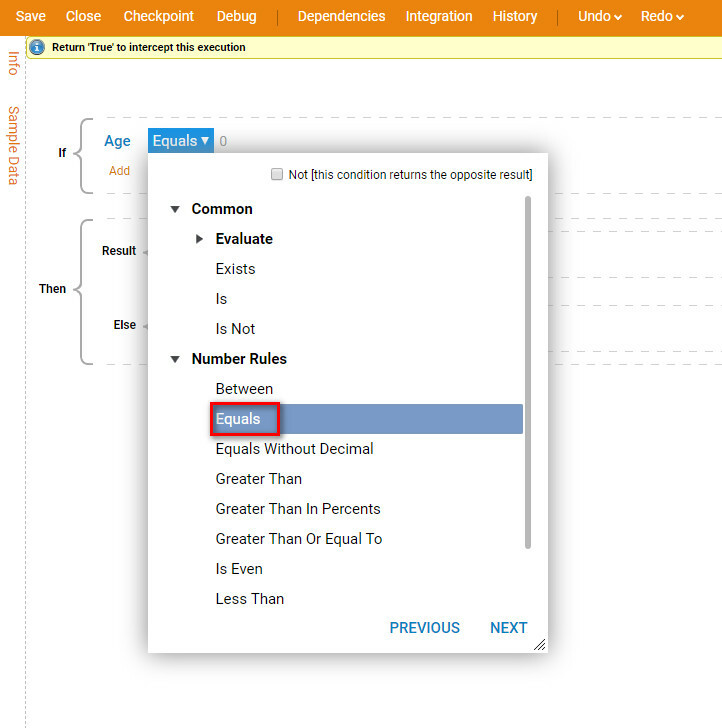 The phrase builder will show how the current Intercept Data	would evaluate for the specific instance. Choose the correct verb for the Rule from the options in the drop-down list. The Rule Phrase evaluates against the Intercepted Data	. In the Value	for the Rule Phrase under Inputs select Constant	and define a constant number forAge	. The constant is defined as 5. In the Rule designer view all pastIntercept rule data	and how they evaluated by selectingSample Data	on the right side action panel. Select Rule Set Data and then select one of the data sets that have already been evaluated. This example shows that a 0year old bird has been evaluated as False.